Several lanes of traffic on the Sydney Harbour Bridge were closed late on Friday night after a fire broke out on a bus. 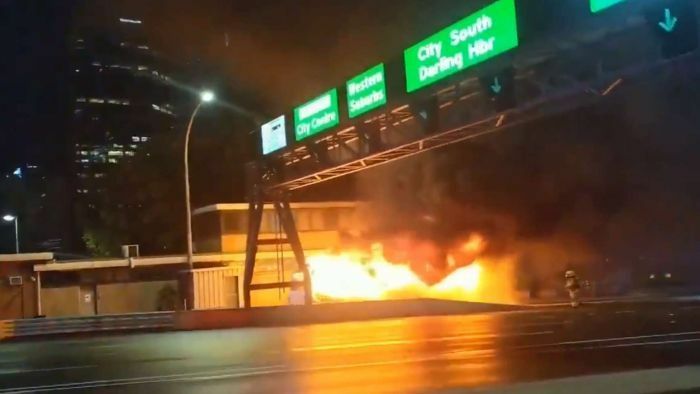 Just after 11:00pm (AEDT), a motorist noticed the bus on fire while driving along York Street on the Harbour Bridge, and signalled to the bus driver. The bus then stopped and evacuated all 26 passengers, believed to be a group from a wedding party. Three southbound lanes were closed, and six fire trucks and 24 firefighters arrived and extinguished the flames on the bus as well as a nearby building, which had also partially caught alight. No passengers were injured, but the bus was completely destroyed by the fire and the building received minor damage. An alert from the Trans-Help Foundation warned people to avoid the area.